Wind bi syndrome accompanying deficiency of qi and blood characterized by painful joints, numbness or heaviness in the limbs and muscles or tremors. 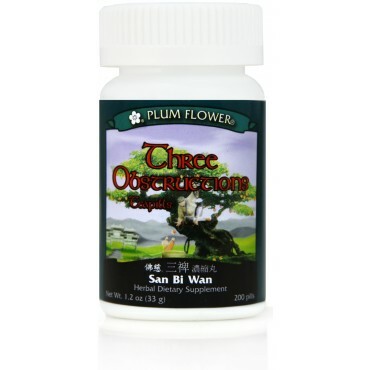 Cold bi syndrome, deficiency (qi, blood and yang) bi syndrome, Rheumatism, osteoarthritis, aching tendons, deficiency tremors including Parkinson's Disease are some of the imbalances satisfied clients have used this product for. Expels Wind, Eliminates Damp, Tonifies Liver and Kidneys, Tonifies Qi, Nourishes Blood, Invigorates Blood, Warms Kidney Yang, Warms the Channels and Collaterals. Dipsacus asperoides root, Eucommia ulmoides bark-fried, Saposhnikovia divaricata root, Cinnamomum cassia bark, Panax ginseng root, Poria cocos fungus, Angelica sinensis root, Paeonia lactiflora root-wine-fried, Astragalus membranaceus root, Achyranthes bidentata root-wine-fried, Glycyrrhiza uralensis root-prep, Gentiana macrophylla root, Rehmannia glutinosa root-raw, Ligusticum chuanxiong rhizome, Angelica pubescens root, Activated carbon, Botanical wax, Talcum. - Xu duan, Chao du zhong, Fang feng, Rou gui, Ren shen, Fu ling, Dang gui, Jiu chao bai shao, Huang qi, Jiu chao niu xi, Zhi gan cao, Qin jiao, Sheng di huang, Chuan xiong, Du huo, Activated carbon, Botanical wax, Talcum. Contraindicated during pregnancy. Contraindicated during the early stages of acute infection or illness, such as cold or flu. Use with caution for imbalances due to Yin deficiency or excess heat.